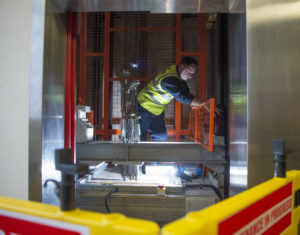 Our lift servicing, maintenance and repairs service is carried out by Lift and Engineering Services Ltd, who provide a 24 hour, 365 days a year emergency support facility. We also offer a planned, preventative maintenance service which is tailor-made to suit individual requirements to reflect the lift type, environment and usage. We can also provide specialist access equipment and solutions for people with disabilities or mobility issues both in the home and in a commercial environment. This includes vertical and inclined access, wheel chair lift or disabled stair lifts. To provide an immediate response to issues, we use a state-of-the-art Digital Pen System, to receive data files and call-out reports on the hour, every hour. Lift and Engineering Services Ltd is based in the West Midlands and hold a comprehensive range of modern equipment. This enables us to work on most types of lifting and handling systems to suit a variety of applications, including listed buildings. The location is also used to manufacture lift and escalator components, which can often be beneficial when we come across parts and equipment that are difficult to obtain or have become obsolete.